Bob Miller awarded Medal of Honor American Institute of Architects Orlando « R. Miller Architecture, Inc.
A jury of peers selected Bob Miller for the prestigious Medal of Honor, the highest honor that the Orlando American Institute of Architects can bestow on an individual. It is conferred by the AIA Board of Directors in recognition of a significant body of work of lasting influence on the theory and practice of architecture. 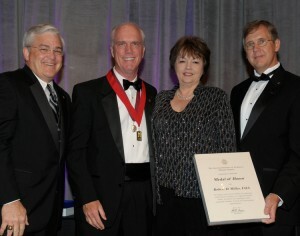 Miller accepted the honor alongside his wife, Diane at the annual gala at the Orlando Country Club.